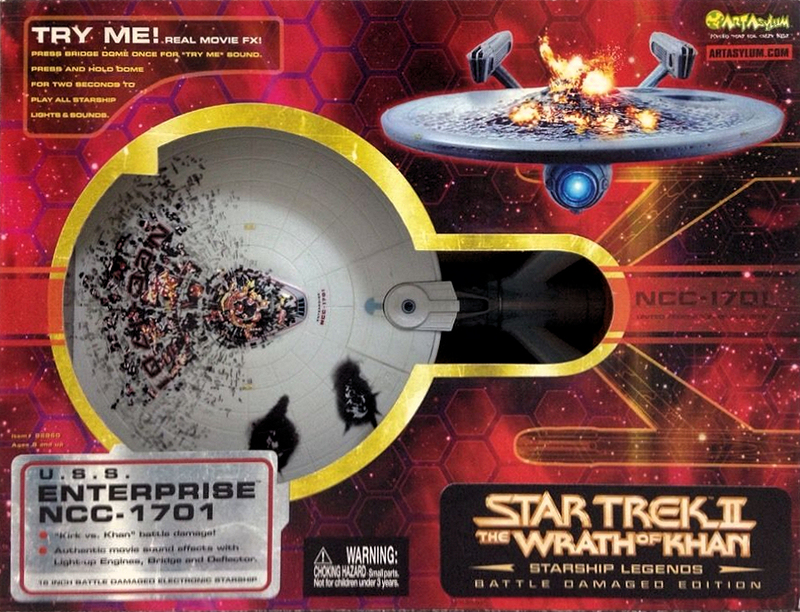 Description: Battle damaged version of the Enterprise, not episode specific. Description: The 1701-A, the first version of the Constitution class refit released by Art Asylum. Releases: First released in 2003, it was reissued after a decade in 2013. In 2015 an The Undiscovered Country version was released, with new a revised paint-job and new film-specific sounds. It was reissued again in 2018 in new packaging. Coverage: 2015 edition lights and sounds video, 2018 packaging. Purchase: Amazon.com, Amazon.co.uk, Amazon.de, Things From Another World, Entertainment Earth. Description: Gold version of the USS Enterprise-A, released to commemorate the 50th anniversary of Star Trek. Releases: 2016 San Diego Comic Con exclusive, a limited edition of 300. Description: The Wrath of Khan version of the refit Enterprise. Releases: This variant was first released in 2007, and was reissued in 2013. Purchase: Amazon.com, Amazon.co.uk, Amazon.ca, Amazon.de, Amazon.fr, Entertainment Earth, Forbidden Planet. Description: Battle damaged version of the refit. 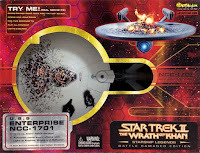 While marketed as a The Wrath of Khan release, the battle damage includes a mid-self destruct saucer damage print, so more accurately it is a The Search For Spock version. 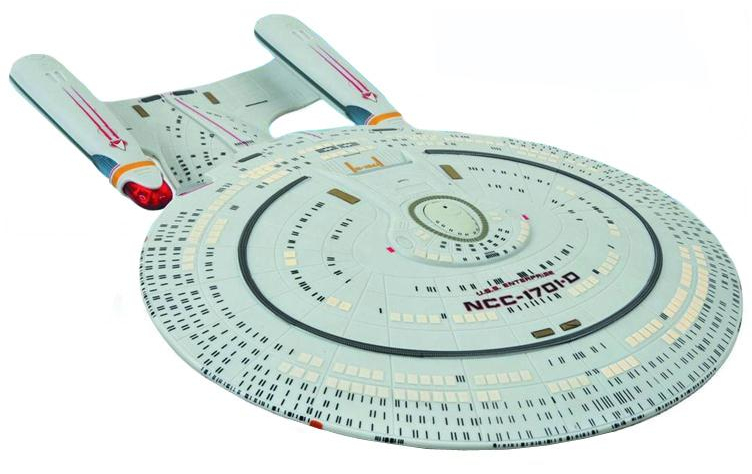 Releases: 2003, technically the first release of the 1701 refit. 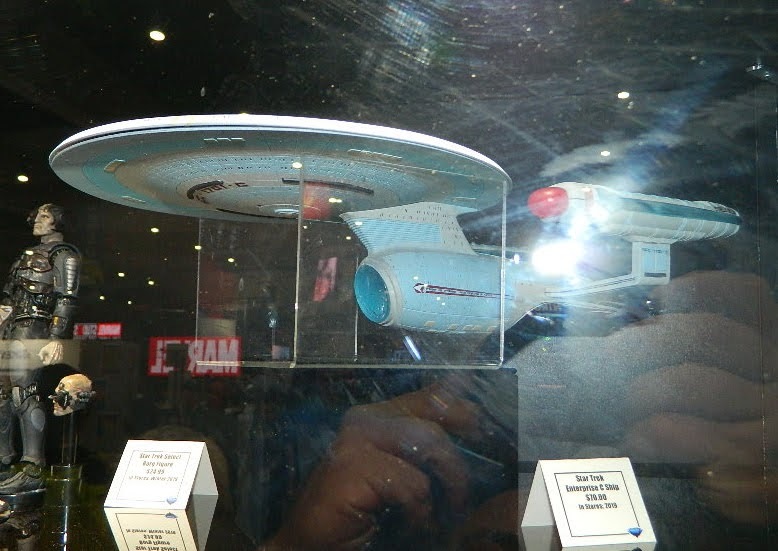 Description: A second battle damaged version of the refit Enterprise, this time limited to the The Wrath of Khan damage. 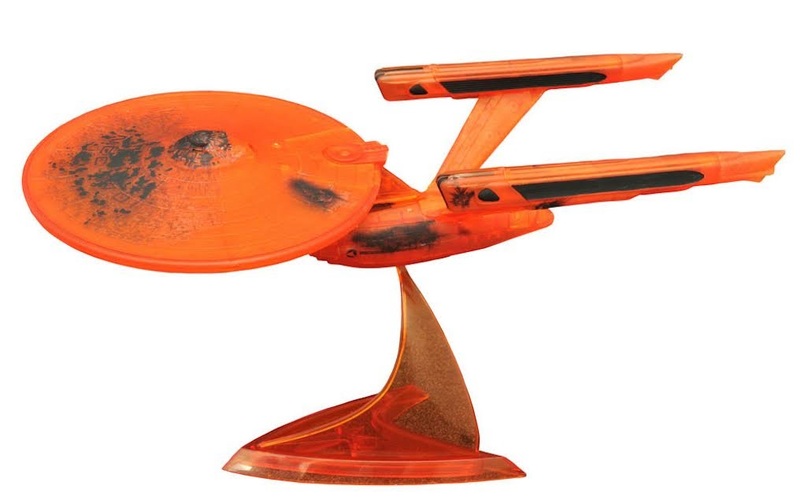 Description: Another battle damaged version of the refit Enterprise, this time made in translucent orange plastic to give the impression of the ship's final moment's as a fireball falling towards the Genesis planet. The electronics were omitted so not to show through the clear plastic, so this has no light or sound features. Releases: 2017 San Diego Comic Con exclusive, a limited edition of 400. Description: Enterprise-E, based on its appearance in Nemesis. Releases: First released in 2006, and reissued in 2013, then updated and marketed as a Nemesis version of the ship. Purchase: Amazon.com, Amazon.co.uk, Amazon.ca, Amazon.de, Amazon.fr, Amazon.it, Entertainment Earth. 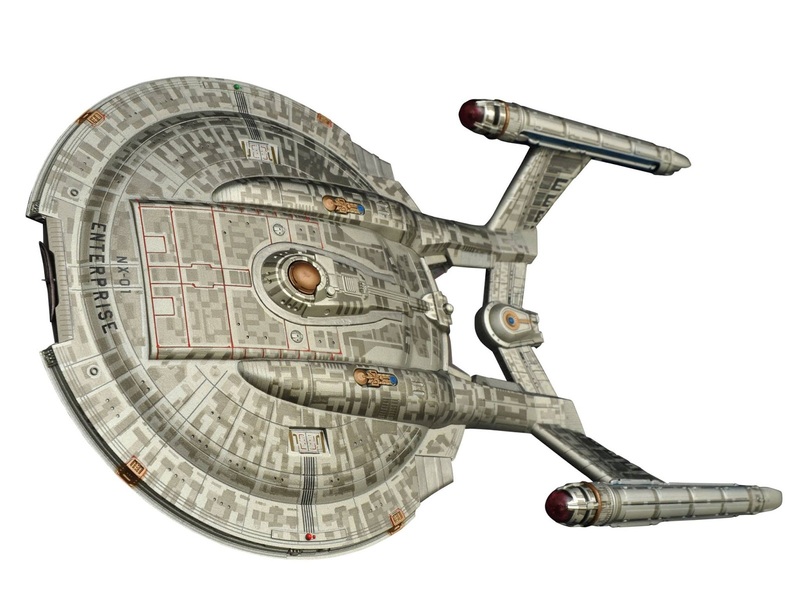 Description: Enterprise-E, based on its appearance in First Contact. Purchase: Amazon.com, Amazon.co.uk, Amazon.ca, Amazon.de, Amazon.fr, Amazon.es, Amazon.it, Entertainment Earth. 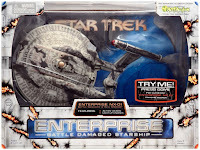 Description: Battle damaged version of the Enterprise-E, not movie specific. 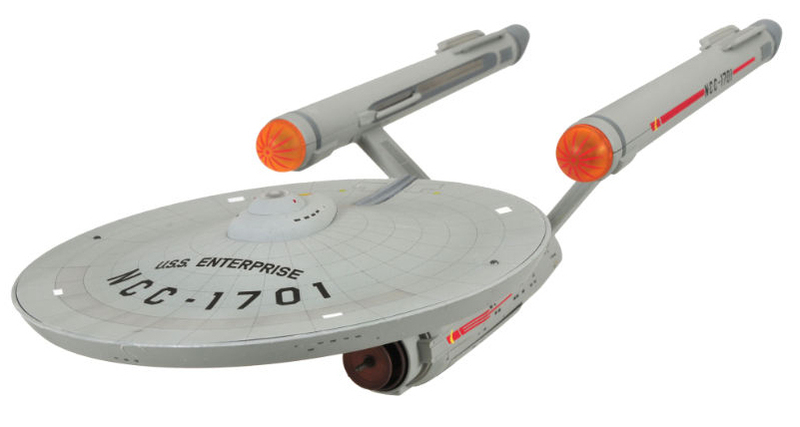 Description: First version of the classic USS Enterprise. Releases: First released in 2007, and reissued in 2009. Purchase: Amazon.com, Amazon.co.uk, Amazon.de, Enterprise Earth. 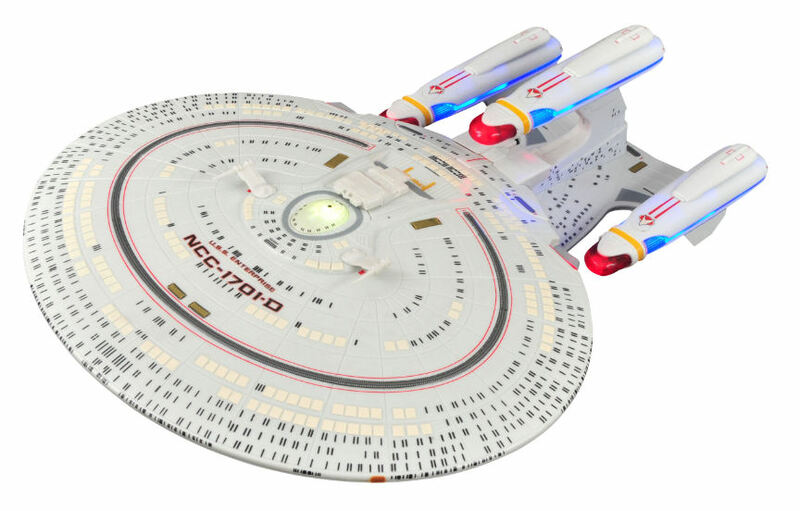 Description: Variant of the Enterprise inspired by the TOS remastered CGI model, featuring more prominent printing on the grid-lines, and brighter nacelle caps. Releases: This variant first released in 2009, and reissued in 2013. It was reissued again in 2015, no longer marketed as the HD edition, but featuring the same detailing, plus new updates to the sound and light features, including a lights-on feature and the entire opening monologue. Coverage: 2015 edition lights and sounds video. Purchase: Amazon.com, Amazon.co.uk, Amazon.ca, Amazon.de, Amazon.fr, Things, From Another World, Entertainment Earth. 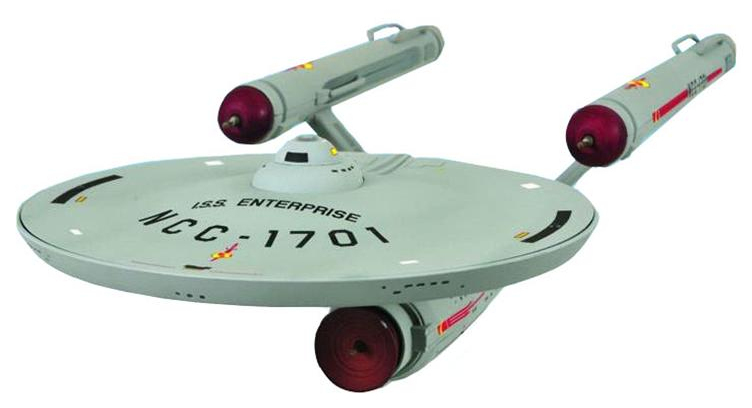 Description: USS Enterprise detailed as it appeared in the pilot episode. 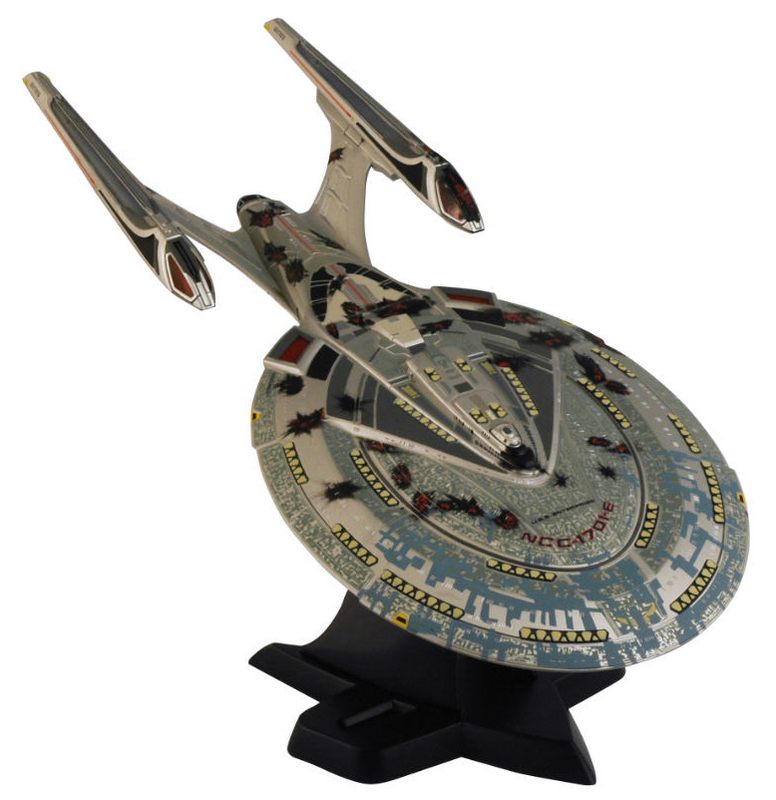 Description: USS Enterprise detailed as it appeared in the second pilot episode. 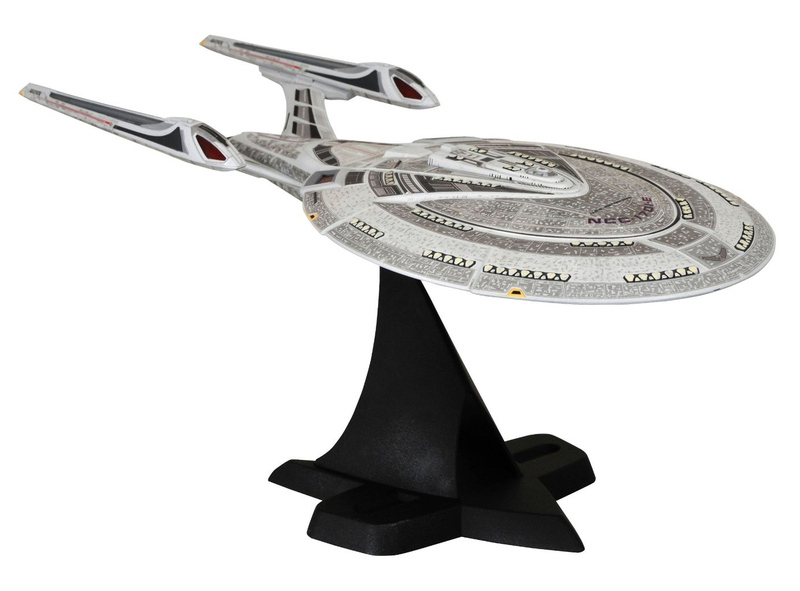 Description: ISS Enterprise variant, based on the mirror universe episode Mirror, Mirror. 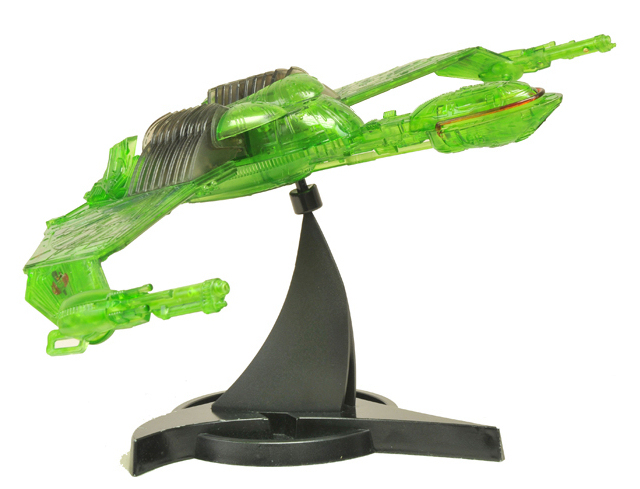 Description: USS Defiant variant, made from translucent plastic to give the effect of the interphase from the episode The Tholian Web. The electronics were omitted so not to show through the clear plastic, so this has no light or sound features. Releases: 2015 San Diego Comic Con exclusive, limited edition of 200. 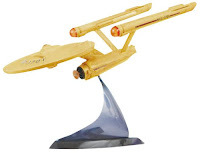 Description: Gold version of the USS Enterprise, released to commemorate the 40th anniversary of Star Trek. Releases: Exclusively released by Blister Shibuya in Japan in 2007, a limited edition of 300. 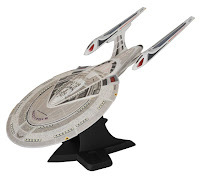 Description: The USS Enterprise-D from TNG. 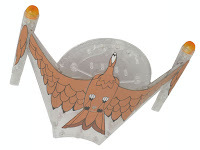 Features magnetically held saucer separation feature. Releases: First released in 2009, and reissued in 2013. Purchase: Amazon.com, Amazon.co.uk, Amazon.ca, Amazon.de, Amazon.fr, Amazon.co.jp, Entertainment Earth, Forbidden Planet, ThinkGeek. 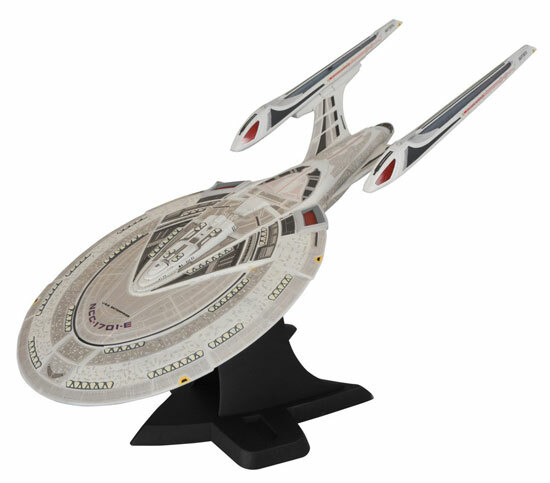 Description: The first Excelsior class release, the refit-style Enterprise-B, as seen in Generations. Coverage: Lights and sounds video, packaging images. Purchase: Amazon.com, Amazon.co.uk, Amazon.ca, Amazon.de, Amazon.fr, Amazon.it, Things From Another World, Entertainment Earth. 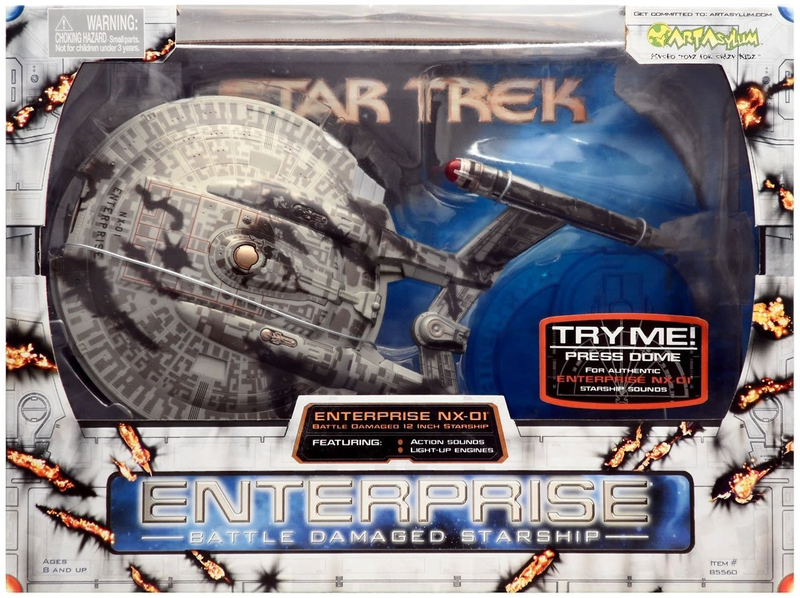 Description: Battle damaged variant of the Enterprise-B, based on Nexus damage seen in Generations. Description: The Undiscovered Country (Captain Sulu) version of the USS Excelsior. Coverage: Images and lights and sounds video. Purchase: Amazon.com, Amazon.co.uk, Amazon.ca, Amazon.de, Amazon.fr, Amazon.es, Things From Another World, Entertainment Earth. Description: The Search For Spock (Captain Styles) version of the USS Excelsior. Coverage: Lights and sounds video. 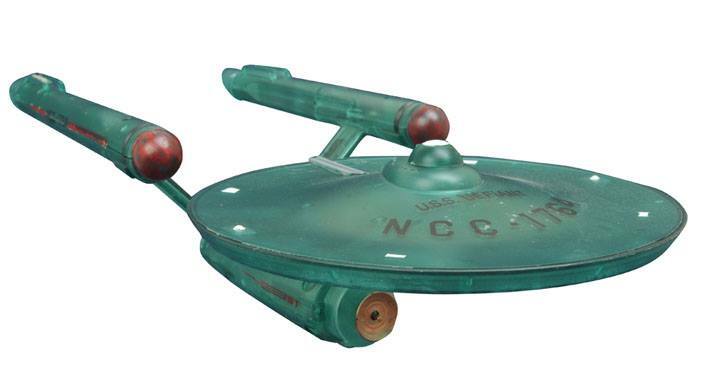 Description: Battle damaged variant of the The Undiscovered Country (Captain Sulu) version of the USS Excelsior. Releases: 2014 San Diego Comic Con exclusive, limited edition of 100. Description: The Undiscovered Country (General Chang) Klingon Bird of Prey. Description: The Voyage Home variant of the Klingon Bird of Prey, which comes with an additional landing gear part. Purchase: Amazon.com, Amazon.co.uk, Amazon.ca, Amazon.de, Amazon.fr, Amazon.es, Amazon.it, Amazon.co.jp, Entertainment Earth. Description: The Search For Spock (Commander Kruge) version of the Klingon Bird of Prey. Made out of translucent plastic to give the impression of being "partially cloaked". 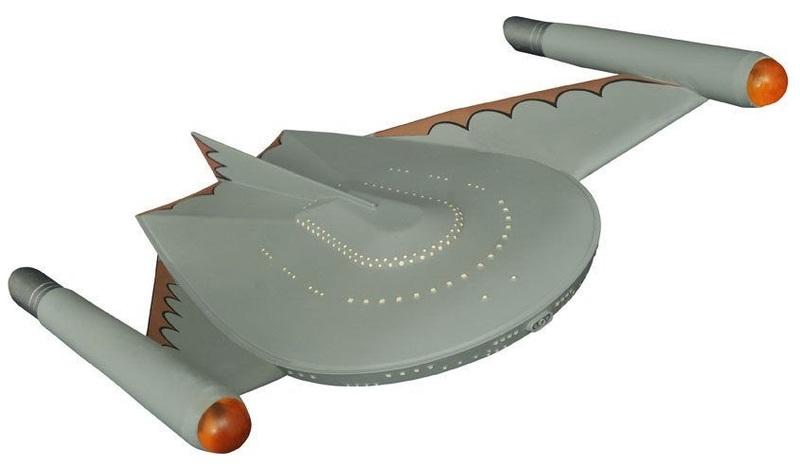 Description: Cloaked version of the Klingon Bird of Prey. The electronics were omitted so not to show through the clear plastic, so this has no light or sound features. Releases: 2013 San Diego Comic Con exclusive, limited edition of 200. Description: TOS Romulan Bird of Prey. 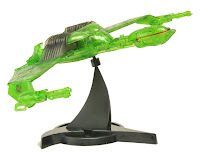 Description: Cloaked version of the TOS Romulan Bird of Prey. The electronics were omitted so not to show through the clear plastic, so this has no light or sound features. Releases: 2018 San Diego Comic Con exclusive, limited edition of 200. Description: Unannounced ship in development. 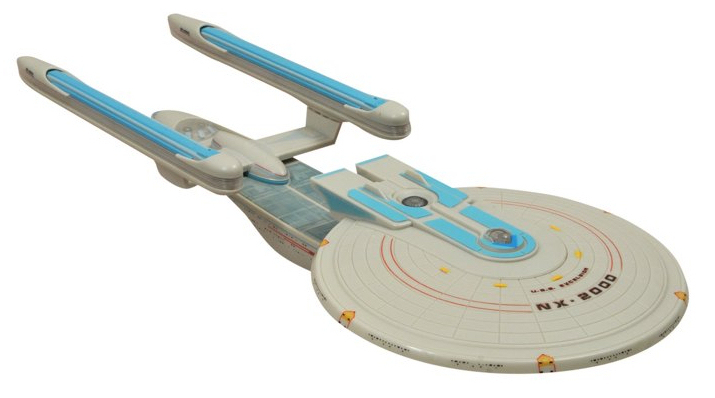 Description: The Wrath of Khan's USS Reliant. Coverage: Toy Fair plans display, prototype. 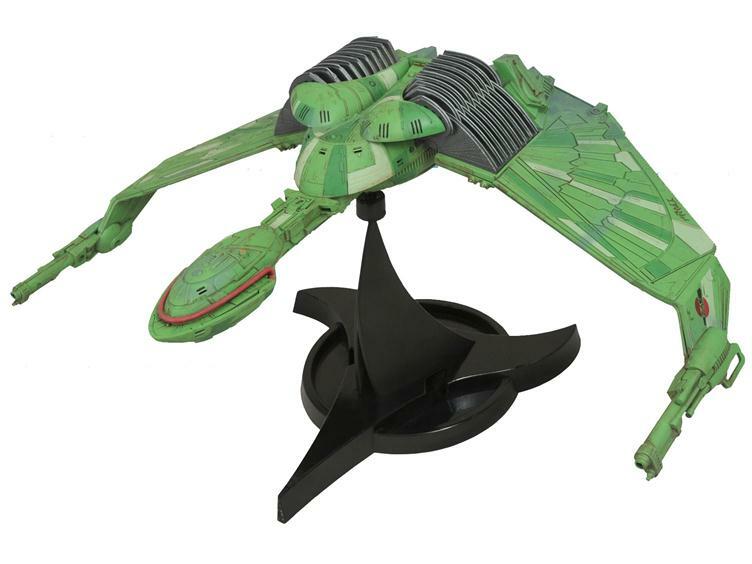 Oh I wish they would create a DS9 or Defiant model. 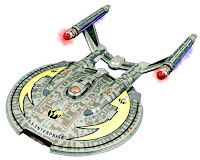 I recall them pretty much ruling out DS9 entirely in one of the previous Ask DST posts (don't know why, if Wizkids can pull it off, and many before them, it cant be a technical issue, and it's as iconic as any Enterprise). I think the Defiant has a good chance though, they've not got many major ships left, and surely want to continue to release something! A Voyager would be great! I doubt if the interest would be there for the station, but for Defiant and Voyager there should be!